Recently, Canadian Lawyer’s Elizabeth Raymer spoke with Lynn Foley, fSquared Marketing CEO , about what matters most to millennial law students and how the values of this generation will impact the profession. During their interview, Lynn shared her surprise that, in this day and age, law students were still entering the profession without feeling prepared for the business of law. “To see that 66 per cent of students felt they were not prepared at all was a little shocking,” Lynn noted. For better or worse, the work of training the next generation of lawyers in how to pitch a client, market themselves, and brand their services is likely to fall on law firms. Forward-thinking law firms will rise to the challenge, whether this is through formal training or a culture of mentorship. But less prepared firms may not have the resources or the knowledge to fill this gap. This would be unfortunate for both new graduates and the firms they enter. Some law schools have identified this issue and are taking steps to prepare graduates for the changing nature of the legal profession. We applaud these universities for their foresight. On the bright side, today’s students are eager to learn. 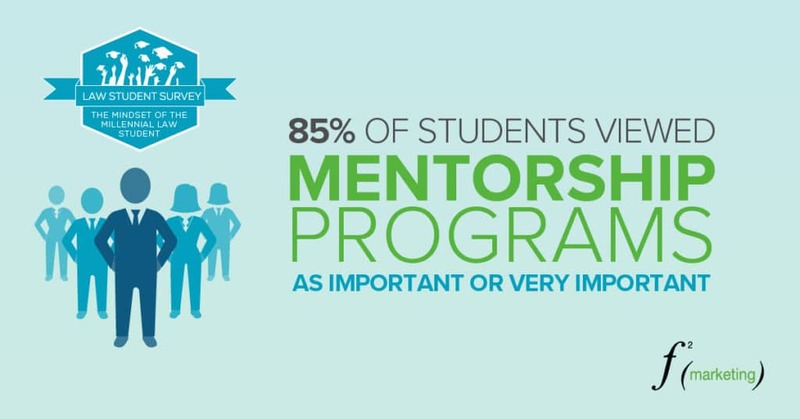 According to the results of the Law Student Survey, 85% of students judged mentorship programs to be “important” or “very important”. They also valued formal training programs far more than social events and even more than bonuses. Elizabeth Raymer and Lynn Foley also discussed the importance of law firm websites in wooing new graduates. In this day and age, every major life and career decision starts with a Google search. The process that law students go through in researching their options is no different. “93 per cent of students visited firms’ websites in researching their employment opportunities, and many made their application choices based in part on how well they liked those websites”—Canadian Lawyer. In the interview, Lynn also noted a millennial focus on balance. Some might count this as further evidence that this generation doesn’t know the meaning of hard work. We view this instead as a welcome remedy. The profession of law has long been plagued by stress and burnout. Millennial values could help to change that. A 2012 survey commissioned by The Canadian Bar Association’s Legal Profession Assistance Conference (LPAC) found that 57% of lawyers surveyed were concerned about working more hours. This survey also found that 31% of respondents judged their mental health to be “fair or poor”. Many in the industry would welcome a change. The values and priorities of a new generation of law students could very well serve as the catalyst.